Brian Magee has the chance to complete a hat-trick of victories over Danish opponents when he takes on Mikkel Kessler later this year. The Belfast man will travel to Denmark to fight Kessler for the vacant WBA world super-middleweight title. 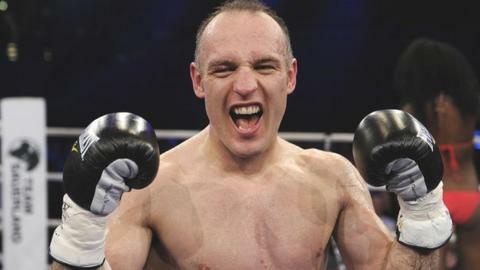 Southpaw Magee, 37, defeated Mads Larsen in 2010 and his fellow Dane Rudy Markussen in February. Andre Ward is the WBA's super champion at 168lb, while Magee is fighting for the governing body's secondary belt. Kessler ended Carl Froch's unbeaten record when he defeated the Englishman for the WBC super-middleweight title two years ago. "I am ready for the hat-trick of KO's - I've stopped Larsen, I've stopped Markussen and now it's Kessler's turn," said Magee. "He's a great fighter, no doubt about that, but I have the tools to break him. "He ran from a fight earlier in the year after he was ringside and witness to the destruction of Markussen, but now I have him and he will go the same way." Kessler, who had a knock-out win over Allan Green in May, is determined to prevent Magee securing the treble. "I look forward to fighting Magee - he's a good boxer with a lot of heart," he said. "It takes something to come to Denmark and knock out both Mads and Rudy. But his winning streak will end when we meet. "It will be interesting as I think it will be a little like a national team match, I am a proud Dane and this guy will take a beating for having knocked out my countrymen." The fight is expected to take place in late November or early December.